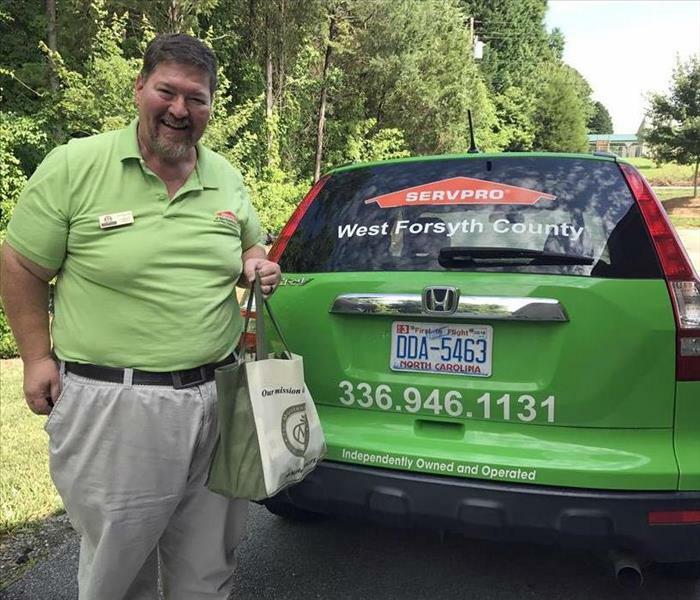 SERVPRO of West Forsyth County is a local small business. All of us who work here obviously live here most were born and went to school here locally. We are an intricate part of the community. And that is intentional, because it is important to us as a business family to be a part of the community. We have made it our mission to ensure that we are part of helping people put their homes or business back together. And we also enjoy helping to improve the quality of our community by being an active member with organizations within the community. Our commitment to assist has also been in the form of aid in packaging meals for local children in need. Collecting food for the local Clemmons Food Pantry in cooperation with the Lewisville Clemmons Chamber of Commerce. The owner, Jeff Meadows has used his expertise in assisting hurricane victims rebuild and mitigate water damage with the Clemmons United Methodist Church men’s group. We do all this because not only do we love where we live we care about the community that we live in. Yes we provide a service and this community has used us because of our expertise. But know that once the green truck pulls up to your home or business the people in that SERVPRO vehicle care about helping you and your family.